Here's a tasty twist on classic American meatloaf, with a blend of Mexican-style cheeses and chunky salsa. Mix meat, stuffing mix, tomatoes, 1-1/4 cups cheese, 3/4 cup salsa, eggs and garlic until blended. Shape into 2 loaves in 13x9-inch baking dish. Bake 50 min. Meanwhile, mix remaining salsa and sugar. Spread salsa mixture over meatloaves; top with remaining cheese. Bake 10 min. or until meatloaves are done (160ºF). Trim 50 calories and 6 g of fat, including 3 g of saturated fat, per serving by using extra-lean ground beef and KRAFT 2% Milk Shredded Cheddar Cheese. Add 2 tsp. chopped canned chipotle peppers in adobo sauce to salsa and brown sugar mixture. The canned chipotle peppers in adobo sauce come in a variety of can sizes. Freeze any leftover peppers in airtight container until ready to add to your favorite soup, baked pasta or Mexican dish. Thaw before using. 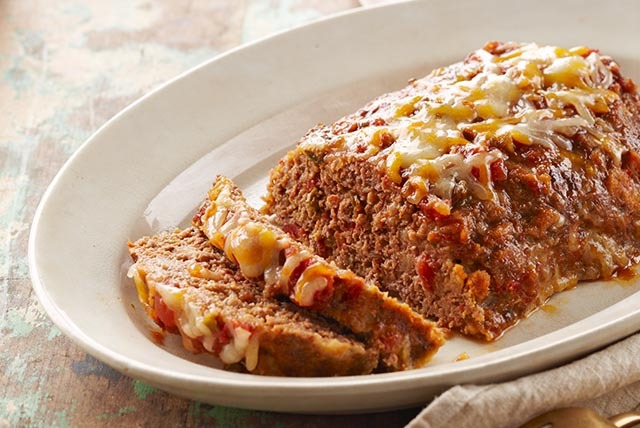 Enjoy one meatloaf tonight. Then, cool remaining meatloaf, wrap tightly and freeze to serve as part of a second meal another night.